Tuaregs at the January 2012 Festival au Désert in Timbuktu, just before the MNLA (National Liberation Movement of the Azawad) launched a rebellion in the same month. The Au Roi du Café in Paris, is emptied of its usual customers and occasional tourists when Fatoumata Diawara makes her entrance like a majestic kaleidoscope: from her poise, to her multicolored bracelets and piercings topped by her painted red braids flowing from a flowered turban. We arrive here at Rue de la Chapelle where negritudes intersect, African skins and Jewish Orthodox hats, and the symbolism of this meeting point immediately emerges. The restaurant, brasserie et bistro is just off a metro station that is named after Marx Dormoy, a socialist activist arrested and murdered in 1941 during the Nazi occupation of France, because of his opposition to an attempt to give extensive powers to Marshal Pétain and the Vichy government. Actress, dancer, songwriter and performer Fatoumata who is 30-years-old, has decided to defy groups like al-Qaeda in the Islamic Maghreb (AQIM), which are trying to establish a caliphate in northern Mali and formed a superband. Mali is a state in West Africa that since becoming independent in 1960 has faced four coups in the North and descended into chaos when the National Liberation Movement of Azawad (MNLA, separatist Tuareg) attacked the Malian army, on January 18th 2012, joining forces with AQIM and other groups such as Mujao and Ansar e-Dine. They are supporters of a “holy war” and have managed to take over two-thirds of the territory. These events were followed by a military coup, on March 22nd 2012, which overthrew President Amadou Toumani Touré. On January 11th, 2013, before the advance of Islamists to Bamako, the capital, France decided to intervene militarily. The withdrawal of more than 3,000 soldiers that were mobilized began four months later but a force of about a thousand will remain in the former French colony to support an African mission under UN mandate. “I was in Bamako [the capital], when I began to hear that they were destroying koras and ngonis, n’jarkas and xalams, baras and balafons, sokus and shekeres, dununs and djembes, and several other musical instruments [of strings and percussion]. More dramatic: they were preventing people from singing”, Fatoumata recalls. “‘What can I do?’, I wondered. We must rebel in defense of our culture, our roots. I did not know back then that France was already preparing to intervene; a few days after the troops’ arrival, I decided to write a song that would serve as an appeal for peace, unity and reconciliation. Once it was finished, I was on the phone for three days calling all the artists that I knew. It was amazing the positive feedback that I got from everyone. Three days later we were recording, working on arrangements and editing. In little more than a month, a seven-minutes video was completed. I called it Mali-ko (Peace/La Paix)”. Watch it here. 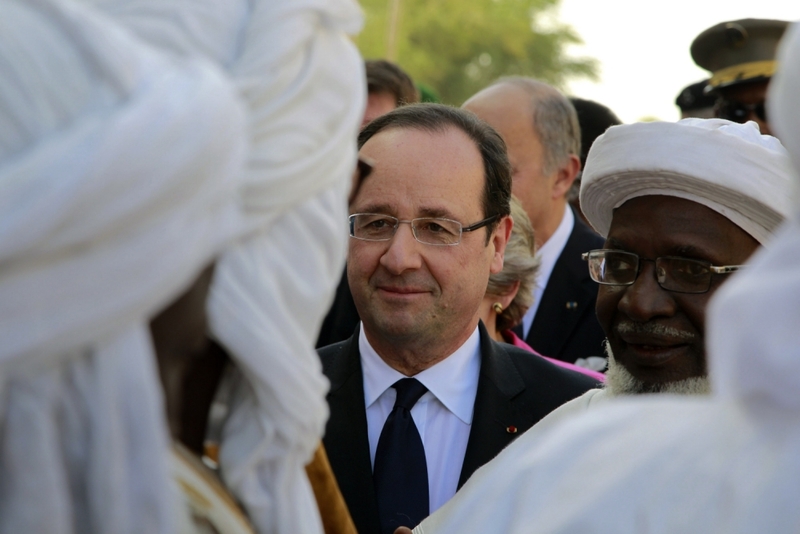 President Francois Hollande visits Timbuktu, Mali, Feb. 2, 2013, making a triumphant stop six days after French forces parachuted in to liberate the desert city from the rule of al-Qaida-linked militants. In an effort to amplify a unified patriotic voice, Fatoumata ensured the presence of beloved figures from across West Africa, namely Khaira Arby, “the goddess of Timbuktu” (whom Islamists threatened to cut off her tongue) and the reggae singer Tiken Jah Fakoly, expelled from his native Ivory Coast and declared persona non grata in Senegal, but who keeps filling stadiums to capacity in Bamako. She also confirmed the presence of Tinariwen, Tuaregs who raised to fame in the legendary Festival au Désert (cancelled this year of 2013 because of regional instability), and of Amadou & Mariam, a blind couple who last February won a second “Victoire de la Musique” award, the French equivalent of the Grammies, with Folila. It is this album, a rock-blues-jazz-soul-pop-funk combination featuring indie Santigold, rappers Theophilus London, French singer Bertrand Cantat and American guitarist Nick Zinner (of the Yeah Yeah Yeahs), that husband (Amadou) and wife (Mariam) will present in Lisbon at the Coliseum on [April 25th 2013]. It was January 11th2013 when Operation Serval was launched at the behest of President François Hollande. On the 16th, with the French infantry already battling on the ground, the jihadists “avenged themselves” by kidnapping hundreds of foreign workers at a pipeline in the extreme southeast of Algeria. On the 19th, after Malian troops recaptured the city of Konna, the gas central was stormed by Algerian’s special forces: 38 hostages and 29 captors were killed. From the 21 of January onward, troops from Mali and France (to which were added some 2000 soldiers from Chad) in turn regained Douentza, Gao, Timbuktu, Kidal and Tessalit. Fatoumata Diawara is aware, she said, that the war “is far from over, although it is easier to win it than to build peace” in a country with plenty of poverty and lack of justice. She does not hide “disgust” with allegations of “summary executions”, in particular of the Tuareg, by Malian troops. “We need to understand that the oppressors were mercenaries from outside – not our people. The album and the video that we recorded also serve to show the importance of remaining united. I was amazed at the overwhelming response because relatives had warned me to avoid taking political risks. Nevertheless, several radio stations play the song a dozens of times every day”, mentions the women’s rights activist, whose latest album, Fatou, includes a libel against female genital excision. In one of the tracks, Boloko, she denounces: “Ils ont coupé la fleur qui faisait moi une femme” [“They cut the flower that made me a woman”]. Elders have the privilege of sleeping in beds while newcomers sleep under blankets on the floor. Without documents and holding only a three-month tourist visa, many Malians “rent” (in exchange for fees) their permits of residence to relatives with physiognomic similarities. Most of them work primarily in restaurants, construction, domestic service, private security and cleaning companies. For a long time, “after the military coup and the Islamist offensive, few in the West apart from France, cared about the implosion of Mali, a corrupt democracy”, Birrell said, in a telephone call from London, where he was deputy director of The Independent and speechwriter to British Prime Minister’ David Cameron. “There is no country in the world like Mali, where music is an intrinsic part of the social fabric and of the political life; so it was not a surprise, to me that musicians – not unscrupulous politicians and generals – positioned themselves against those who wanted to demolish centuries of tolerance of Sufism”, Birrell added. 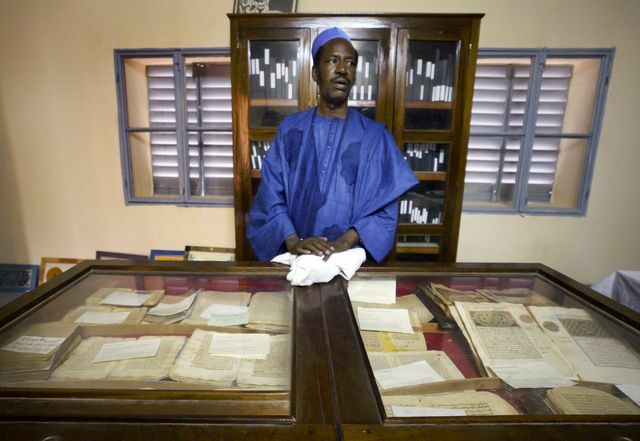 An unidentified worker looks after some of the 20,000 preserved ancient Islamic manuscripts that rest in air-conditioned rooms at the Ahmed Baba Institute in Timbuktu, Mali, in 2004. In Paris, we visited UNESCO’s headquarters at Place de Fontenoy, trying to assess the destruction inflicted by the Islamists until they were forced to disperse by French troops. “More than ever there is a great urgency in getting support from everywhere and in particular from neighboring countries to ensure the preservation of what was not destroyed and to prevent the repetition of such crimes, including international trafficking through porous borders which amounts to about 8000 million dollars per year”, Mrs. Monteil said. The French Minister of Culture, Mrs. Aurélie Filippetti, who accompanied President Hollande to Mali together with UNESCO’s Director-General, Mrs. Irina Bokova, assured that a plan involving the European Union is already under way to train custodians of the precious heritage under threat, especially in Timbuktu the millennial city that attracted distinguished figures as D.H. Lawrence and Leo, the African. Founded by the Magcharen nomads, around 1100 b.C., Timbuktu remained for two centuries an important center on the routes of salt and gold. However, when Europeans arrived here in 1830, it was already in decline. According to Mr. Samuel Sidibé, director of the National Museum of Mali, if on one hand the burned manuscripts “are lost forever,” the mausoleums “may still be rebuilt because there is documentation on their structure; and they would not be difficult to reproduce because many were built of terracotta. The museum’s director is aware of families that have been “burying their manuscripts for centuries”, passing them from hand to hand, from parents to children and grandchildren. They do that in order to preserve the documents from the Islamist predators. Mr. Sidibé regrets that he’s never had the chance to meet one of these families. Old manuscripts have resisted heat and humidity thanks to the quality of their skin covers, paper, the ropes that they’re sewed with and the ink used in calligraphy. In spite of all the efforts “there are families who have been forced to sell their treasured belongings in order to eat or avoid being killed”, Mr. Sidibé grieved.